Using reception history as its basis for study, Isaiah Through the Centuries is an unprecedented exploration of the afterlife of the Book of Isaiah, specifically in art, literature, and music. This is a commentary that guides the reader through the Book of Isaiah, examining the differing interpretations of each phrase or passage from a variety of cultural and religious perspectives, Jewish, Christian and Muslim. Clearly structured and accessible, and richly illustrated, the book functions as a complete and comprehensive educational reference work. Isaiah Through the Centuries encourages readers to learn with an open mind and to understand how different interpretations have helped in the teaching and comprehension of the Bible and Isaiah’s place in it. As part of the Wiley-Blackwell Bible Commentaries series, which is primarily concerned with reception history, the book emphasizes that how people interpret the prophet—and how they’ve been influenced by him—is often just as important as the sacred text’s original meaning. 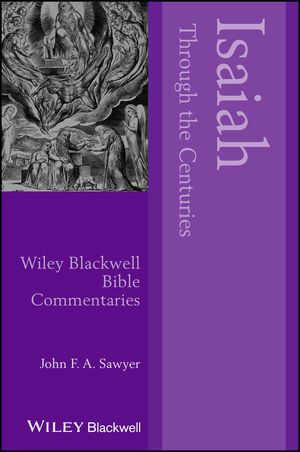 Comprehensive in scope, Isaiah Through the Centuries is a much-needed resource for all those interested in the influence of the Bible on Western culture, and presents unique perspectives for anyone interested in the Bible to discuss and debate for many years to come. John F. A. Sawyer is Honorary Professor of Theology and Religion at Durham University and Honorary Fellow in the School of Divinity at Edinburgh University. In addition to The Fifth Gospel: Isaiah in the History of Christianity (1996), his more recent publications include A Concise Dictionary of the Bible and its Reception (2011) and, with musician Siobhán Dowling Long, The Bible in Music: A Dictionary of Songs, Works and More (2015).